1960: Peace March at Kester and Noble in Sherman Oaks, CA. At the height of the Cold War, a brave and liberal minded group of progressive people marched through Los Angeles and eventually ended up in Moscow where they worked to defuse tensions between the US and the Soviet Union. Los Angeles at that time was a conservative, anti-communist city whose main industry, Hollywood, was just emerging from the blacklist and any association with Russia was tantamount to career suicide. The Committee for Non-Violent Action (CNVA) was an American anti-war group, created in 1957. Its purpose : resist the US government‘s testing of nuclear weapons. It used non-violence to oppose atomic military tools. The group was often attacked as pacifist and for its welcoming of African-Americans into the fold. Photograph article dated December 22, 1960 partially reads, “Eight foot–sore peace walkers marched through the Valley Wednesday on the 11-month tour that will take them from San Francisco to Moscow, Russia. The placard-bearing marchers, who represent the Committee for Nonviolent Action, stopped Wednesday night at Highland avenue and Hollywood boulevard in Hollywood. They will remain in the Los Angeles area until Christmas day when they will resume their march toward Tucson, Ariz. 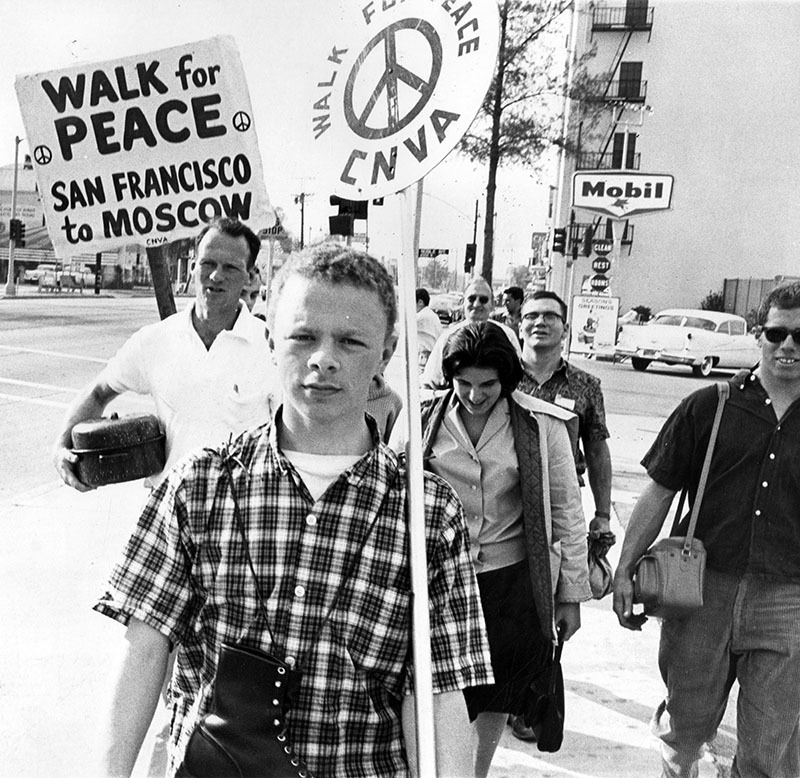 In addition to having their board and room paid for by the committee, which is composed of 60 Americans, the hikers have seven administrators and advance publicity men making the tour with them.” Bruce McIntyre, 20, leads the peace walking team along Ventura Blvd. near Noble Ave. Most interesting. I was in junior high then and totally oblivious to things like this. Bruce McIntyre doesn’t seem very old either. I wonder what happened to him. ← Fashionable Life: Van Nuys, 1959.